Running to be New Jersey's first Lieutenant Governor. Next week New Jersey will be electing not only a Governor, but for the first time a Lieutenant Governor as well. Until now the President of the New Jersey Senate or the Speaker of the New Jersey General Assembly would become Acting Governor in case of a gubernatorial vacancy. This year both of the Democratic candidates for Lieutenant Governor are renowned Jewish women: Loretta Weinberg in New Jersey, and Jodie Wagner in Virginia. Our Alan Tuttle recently interviewed Loretta Weinberg. Loretta Weinberg was born February 6, 1935, in New York. She graduated from the University of California with a BA degree in history and political science. She is widowed, with two children and two grandchildren. Her political career started with her being the Assistant Administrator to the County of Bergen and then a member of the Teaneck City Council. She was elected to the New Jersey General Assembly in 1992, and held that seat until appointed as State Senator in 2005, a post which she has held until now. She has a champion of Jewish Women’s Involvement in the Political Process project sponsored by the CRC, the National Council of Jewish Women's Essex County Section, and the Northern NJ Region of Hadassah mentoring women interested in running for office, advising them with strategies and fund-raising tips. Our readers in Pennsylvania are accustomed to seeing people from New Jersey come to our side of the Delaware River and lend a hand in during close elections. 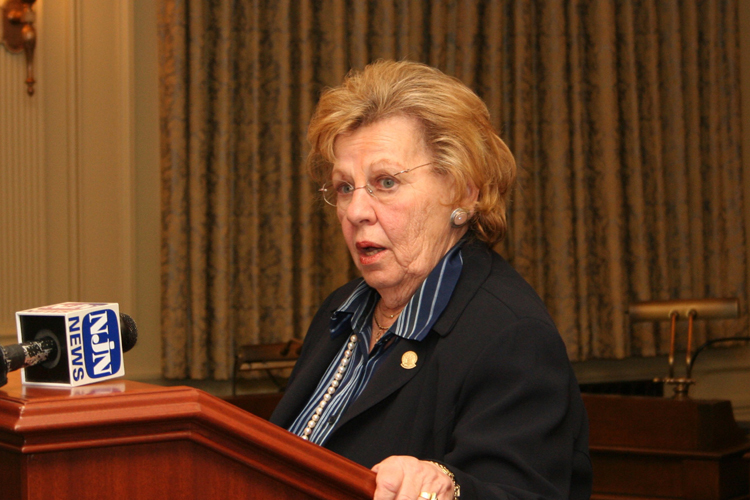 Loretta Weinberg is a veteran of close elections having won the Democratic Nomination to New Jersey State Senate seat by 112-111 at the Democratic caucus leading up to the November 2005 special election. Polls indicate that the race in New Jersey is too close call. 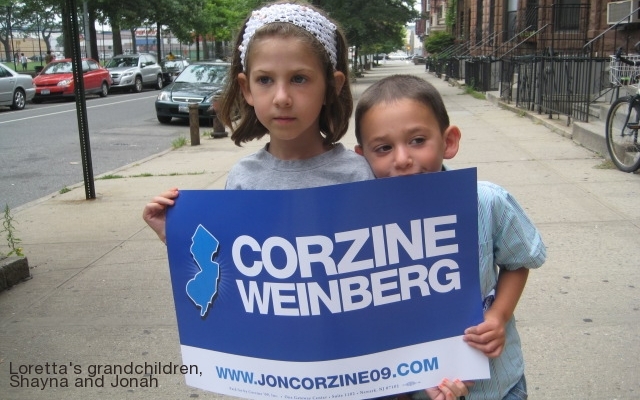 Volunteers are invited to contact Corzine/Weinberg campaign offices throughout New Jersey. PJV: If elected, you will be New Jersey's first Lieutenant Governor. Until now the President of the New Jersey Senate or the Speaker of the New Jersey General Assembly would become Acting Governor in case of a gubernatorial vacancy. Do you think this is an important change? The position was created by referendum to change the New Jersey constitution. It is the result of the fact that the acting Governor would be the Senate President when the Governor was absent for any reason. But we’ve had two or three incidents recently during which the Senate President took over as Governor for long periods of time. First was when Gov. Whitman joined President Bush’s administration, second when Gov. McGreavy resigned, then again when Gov Corzine was in a serious traffic accident. The problem is that it resulted in having the legislative and executive branches mixed up in ways they shouldn’t have been. So I think it is an important change. PJV: How do you see yourself contributing to Governor Jon Corzine's administration? We have had several discussions about that. I think we have had a very good division of responsibilities in looking to his second term. His goals revolve around righting the economy, improving education, and access to healthcare, especially for children who are uncovered. He has asked me to focus especially on this last area. PJV: Speaking of the health care debate, you have fought for hospital care for new mothers and their babies, and advocated for funds for autism research. How do you feel about the level of discourse in the current healthcare debate? I would like to see very strong leadership at the national level, and I hope that the party of which I am a part will stand up for the Public Option and for making sure that the kind of healthcare that women have today will be maintained and be built upon. In speaking about my own party: the leadership could be clearer on what we do stand for. And although we’d like to work across the aisle and develop a bi-partisan plan, we have a set of values, and if the other party doesn’t want to join us in working together, we have to move on and do what’s needed. PJV: You have represented New Jersey's 37th District since 1992 first as a member of the general assembly and since 2005 as State Senator. The 37th District lies in Bergen County and includes Teaneck and Hackensack and has one of the highest percentages of Jewish residents. Are you active in the Jewish community? The 37th District includes Bergenfield and other towns as well. I belong to a synagogue, am active in the National Council of Jewish Women, also Hadassah, so yes, I am active in the community there. PJV: Justice Sonia Sotomayor’s remark about her experience as "a wise Latina woman" informing her decisions on the bench was analyzed to no end during her confirmation hearings. Do you feel that you bring in a unique set of experiences as "a wise Jewish grandmother"? Yes, in fact I do. By the way, I didn’t use word wise, that was your suggestion! But we each do bring a unique set of experiences we bring to our professions. I received a Bachelors Degree in Political Science, and a Masters Degree in Public Administration, and have experience in the business world. All that goes into making me who I am today, that along with the kinds of values that were inculcated into me as a Jewish child and young Jewish woman. Then my experience as a daughter who took care of a frail elderly mother, and a woman who lost husband to cancer made me feel the importance of leave for family members caring for loved ones. Those experiences led me to understand what it is like as a mother... now the great joy of being a grandparent. Those are all the things that help me understand better the lives of others. Sotomayor’s remarks – I can’t say they were taken out of context, because they weren’t. But they were meaningful to people, even though people tried to use them in a derogatory sense. Her experiences growing up as a Latina woman growing up in a project in the Bronx, and a single mother, make her into the kind of person she is today, and hopefully will help bring an extra understanding of the law and its implications. That’s why diversity is important, whether we’re talking about our legislators, our judiciary, our national leaders. PJV: You are one of the three State Senators appointed by the Governor to the New Jersey-Israel Commission. How does the commission work to advance New Jersey’s relationship with the State of Israel? Through a number of ways: through programs that have been run over the years. By the way, it was Governor Corzine who made that commission into a permanent part of New Jersey State government. Before his tenure as Governor it had to be renewed. There have been many relationships fostered through economic development, helping Israeli businesses find a niche in New Jersey and vice versa. A lot of it has been around economic development, some of it has been other: the Commission was responsible for a wonderful New Jersey observance of the 50th anniversary of the founding of the State of Israel. So it goes from business development to more historic significance of the sister state relationship we have. As a post script to that: it was under Gov. Jim McGreavy, and I lobbied for that, that New Jersey made its first investment into Israel bonds; I think they started off investing $10 million dollars. Under Governor Corzine that has been increased measurably, and I think they’re up to $35 million now. PJV: Like many in our community you were hard hit by the Madoff scandal. (Editor’s Note: She lost $1,300,000.) What lessons should we draw from this tragedy? One lesson is that just because the Government supposedly regulates something do not believe it. I was not invested with Bernie Madoff, I was invested in a ‘trusted’ money advisor. We had accountants, we paid my advisor, and I had no idea I was paying him to take all my money and mail it to Bernie Madoff, so I’m a victim of a fraud. What I learned, I think is that first of all Government regulation what I believed it was, and that the SEC wasn’t really regulating this industry very closely. It’s hard to say I learned a financial lesson, because when I think back I do not know what I could have done differently. Our accountant had studied reports that were submitted to him, so called ‘buys’ and ‘sells’, and it added up. But if someone is defrauding you, it is hard to know that. It is the nature of fraud. So although I cannot say I learned much in hind sight, but hopefully our government has learned a lesson. PJV: Why do so few women serve in public office? It is hard for any number of reasons. You do not find too many stay at home moms today. So it has fallen to women to be full time partners in financial life, having jobs. And then it is still the nature of the responsibility of the woman most of the time to provide the extra care that a family needs in terms of health. Who stays home when the child is sick? So women have a little extra responsibility that then makes it difficult to be involved in the kind of activities that lead to running for office. In New Jersey because we have a very dominant county political organization. We have 21 counties, 42 county leaders, the large majority of those are men, and it has been dominated by men, and it has not always been welcoming to women, but that has improved considerably. In the last election cycle we went from 47th in nation in the number of women in the legislature, up to 15th. But having said that, we have I think ten women in the Senate out of 40 in State Senate, hardly representative of our numbers in the population. PJV: Last June, Governor Corzine signed the anti-handgun trafficking bill limiting most people to one handgun purchase per month. Meanwhile, Pennsylvania . . .
To me that is such a no-brainer. I cannot understand why anyone would be against it. I mean is it going to solve crime throughout the state? No, it’s not the panacea to solve crime. But anything we can do to decrease the proliferation of guns on the street crime. I just do not get it. Why anyone feels they need to buy more than one gun a month I don’t get how the guy who is running against us, a former US attorney, could possibly be against that bill. You’re talking about every purchaser can buy twelve guns in a year. It’s just something I can’t understand. Yes, I believe in gun control, among a lot of other things. Sen. Lorette Weinberg's grandchildren Shayna and Jonah show their support. PJV: How has the legislation been received by the community? It has been overwhelmingly supportive. Law enforcement supports it also. The only people I have heard speak out against it is our opposition, and the NRA. There has been a historic element behind this, to be the first in any newly created office, so being the first Lieutenant Governor is a responsibility and a challenge I am looking forward to. Added to that, to be the first Jewish woman in that position adds a little more delectability to it. There has been formed here in New Jersey a Jewish Women’s network to encourage Jewish women to get involved in their community, to learn about campaigns, and to run for office. It is under the auspices of Center for American Women in Politics, with the leadership of some of the women who have been involved in Federation life. We’ve run a few seminars on that, and I’m hoping to see more of that in the future.